Please answer the following questions and submit your request to us. Q1: Please provide us with your "deliver to addresses" postal code and indicate if this is a commercial business address or a residential address which would include home based business. It is required to provide you with a quote estimate as it is a necessary variable when calculating shipping. Q2: Please include your first and last name. Q3: Please include your email address. Q4: Please select the tread type you are inquiring about. 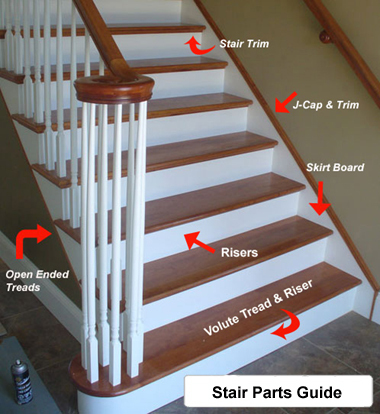 Please note: Standard Treads and Custom Thick Treads are designed to be installed onto your stair frame's stringers while Full False Treads are designed to fit over existing treads or roughed in treads such as one would find when removing carpet from stairs. Q5: How many treads in total and what wood species do you require? Q5: What size treads do you require? If multiple sizes or custom thick treads select that option and enter details below. Q5: If selecting ( Full False / Full False Modern ) treads we require the following measurements. The existing "riser to riser" width or the ( Run ) as it is referred to, this is then transferred to the ( Plowed ) out area on your full false treads ( please see reference photos below). Do not include any overhang or bull nose widths in your ( Run ) measurement. We recommend measuring a number of your existing treads to ensure tread measurements have consistency throughout. Our treads have a standard 9" plowed area, though these can easily be cut to size on site for smaller plow requirements or we can can make them wider depending on our customer's requirements. Once you exceed a 9-1/2" plowed area you are looking at additional costs per tread. Note: To install full false treads it is required that you cut back the existing bull nose ( front edge overhang ) so that the existing treads are square or flush with the existing risers. Q6: Are your treads all enclosed between walls or skirt board or are there some open ended stair treads? Q7: Will you be wanting new risers or the recommended stair trim included with your quote? Ogee Cove Moulding is a finishing trim used to go under the treads front side where the riser meets the bottom of the stair treads underside, to hide the little 1/8 in. and 1/16 in. gaps that may be there after the install. We definitely suggest getting the trim especially if we are doing the finish to ensure match consistency. Typically you require ( 1 ) more riser than you do stair treads per straight run of stairs. For example if you have a continuous run of ( 12 ) treads you'll require ( 13 ) risers, if the stairs are split ( with a landing area etc. ; ) then you'd need ( 14 ) or more risers. 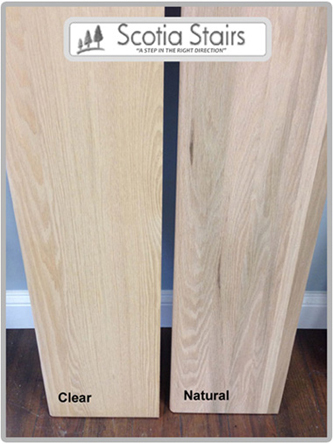 Our risers are sold in 4 ft. or 8 ft. lengths only with the 4 ft. option being the least expensive to ship. If required, can you let us know the number of risers you require? Q8: Can you confirm if " Natural " or " Clear " is the grain face profile you prefer. Oak is shown in the sample and shows the typical face grain differences. On standard treads there is an up cost of $5.00 per tread for the "Clear" profile. There is no up cost for the clear profile on our full false treads, simply customer preference. "Select & Better Clear": a uniform color match face... with little color changes. "Select & Better Natural": more color variations and color character in the treads face. Q9: Do you require finishing on your treads ( clear coat or stain )? 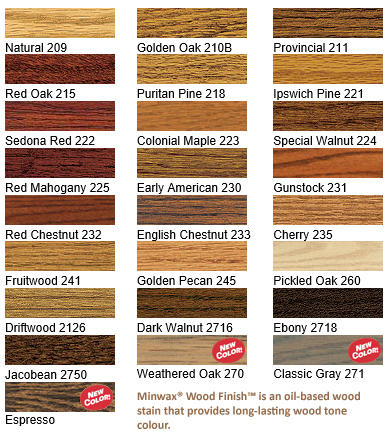 MinWax Stains: The available Minwax stains can be viewed below or we can custom stain match to a physical piece of flooring. Please note, we would need an actual piece of the existing flooring to be color matched sent to us as we can not stain match to a photo. In the stair business a “quick quote” is not always possible due to all the variables that must be accounted for. It is possible, dependent on your answers, that we may still require some additional information to ensure you receive and are properly quoted on the correct sized materials for your staircase project. We look forward to hearing from you and serving your needs!